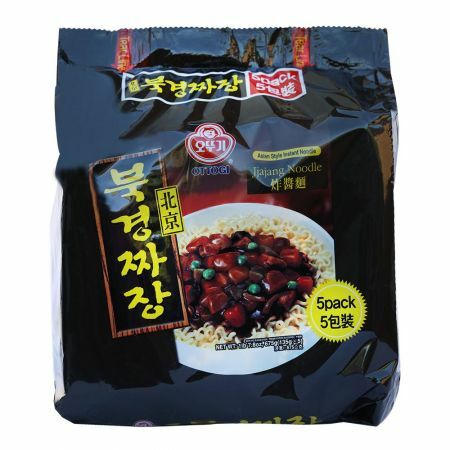 The taste of rich Jjajjang preserving the rich taste of directly roasted onions and black bean paste with chewy and soft noodles. NOODLE:WHEAT FLOUR(WHEAT:AUSTRALIA,USA),MODIFIED STARCH,PALM OIL(MALYASIA),POTATO STARCH(IMPORTED:DENMARK,FRANCE,GERMANY),WHEAT GLUTEN,SALT,EMULSIFIED OIL(SOYBEAN OIL,D-SORBITOL,SOYBEAN LECITHIN,GLYCERIN ESTERS OF FATTY ACIDS),CALCIUM(EGG SHELL),ACIDITY REGULATOR(POTASSIUM CARBONATE,SODIUM POLYPHOSPHATE),ONION CONCENTRATE,YEAST EXTRACT,RIBOFLAVIN,GREEN TEA FLAVORED OIL. SOUP:JJAJANG SEASONING POWDER(BLACK BEAN PASTE,CARAMEL,SALT),SUGAR,VEGETABLE OIL,ONION OIL,SALT,CARAMEL POWDER,ONION OIL,ROASTING ONION POWDER,SOY SAUCE POWDER(SOYBEAN,WHEAT,SALT),FLAVOR ENHANCER,NUTRIENT,MIXED OLIVE OIL,HYDROLYZED VEGETABLE PROTEIN(SOY,WHEAT,CORN),GLUCOSE,SOYBEAN PROTEIN,DEHYDRATED ONION,DEHYDRATED CABBAGE,DEHYDRATED FRIED POTATO,DEHYDRATED CARROT.